Ice cream sandwiches are not a novelty and places proposing them have been popping up all over the place, whether in trucks or brick and mortar places. 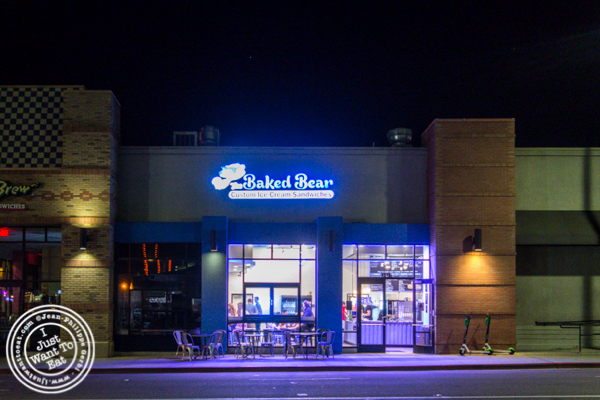 The Baked Bear is one of them. Created in San Diego in 2013 by Shane Stanger and Rob Robbins, this place is a bit overwhelming. Yes, there are so many combinations between cookies, brownies or doughnuts to the variety of ice cream and topping that it is endless. And they make their own cookies. My friend David went for it but I settled for the doughnut sandwich that I tried few years ago at Holey Cream in Hell’s Kitchen. My choice of ice cream was cookies and cream, and I asked for the doughnut to be warm. They then put some blue icing on top and powdered sugar that made the whole experience a bit messy. But worth it! The doughnut was quite good and chewy, and the ice cream delicious. The only negative is that they do not have a bathroom to wash your hands full of sticky sugar, nor do they offer wipes to their customers (they gave us a wet paper towel that did the job). But overall, it is very good and decadent. I definitely recommend it if you are in the area and want something sweet.